An exploration of the history, science, architecture, and mythology of the subterranean landscape and our relationship with the worlds beneath our feet—for fans of quirky, obsessive narrative histories, such as Confederates in the Attic and How Things Work. 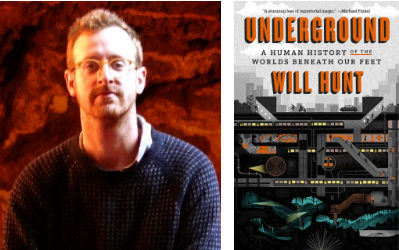 Will Hunt is an urban adventurer who has explored caves and catacombs, subway systems, ghostly mines, and all varieties of holes in the ground. He’s tracked down people who, for one reason or another, have shared his underground fixation, each an incarnation of Hermes, who could see and touch the underworld in ways others could not. Underground is a place of overlapping, often contradictory associations: It is a space that evokes death and burial even as it is a place of origins; it fills us with primordial dread, even as we seek refuge there in times of strife; we dig in search of riches and we bury our most toxic waste. It is a spawning ground for political insurgence and the place governments hide their most sensitive secrets. We excavate in search of scientific truth even as we recognize it as the ultimate wellspring of mythology, magic, and spirits. Hunt explores Paris underground, the famous network of underground dwellings in Turkey, and the hallowed caves of the Australian outback; he spelunks eight thousand feet into abandoned mines in South Dakota with NASA scientists and experiments with time alone in absolute darkness. This is an elegantly written, thought-provoking excursion into both the deepest recesses of the earth and the primal longings of the human psyche. Will Hunt’s writing, photography and audio storytelling have appeared in The Economist, The Paris Review Daily, Discover, and Outside, among other places. A recipient of grants and fellowships from the Thomas J. Watson Foundation, the New York Foundation for the Arts, the Bread Loaf Writer’s Conference, and The Macdowell Colony, he is currently a visiting scholar at the NYU Institute for Public Knowledge. Underground is his first book.